SWEET CUSTOM! 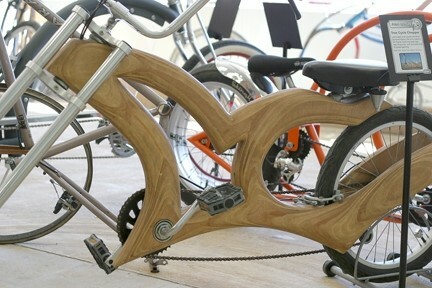 : This bike frame crafted from wood is one of several one-of-a-kind bicycles on display. It’s a sweet day—sunny, 85 degrees, just enough breeze to remind you it’s spring. I’m cruising with my amigo Keith Bond up Hwy. 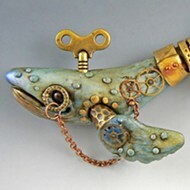 101, top down, chugging over the grade and heading to the Bike Lane Gallery where a bevy of one-of-a-kind custom bikes, interactive bike-related sculptures, and original bike-themed artwork is on display through May. 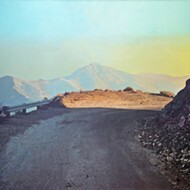 PEDAL POWER: May is Bike Month, and the Atascadero Bike Lane Gallery (5805 El Camino Real) is hosting a month-long bike art exhibition: “Bike Momentum: A Chain Reaction of Art and Advocacy.” Admission is free and open to public. 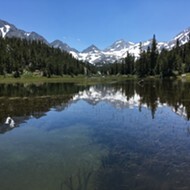 The gallery is open Thursday and Fridays from 5 to 10 p.m., Saturdays from 1 to 10 p.m. (except 5/15 when it opens at 10 a.m.), and Sundays from noon to 4 p.m. On May 6 see alt-indie music by The Clydes & EjiTZ at 8 p.m. On May 7 see indie acts The Skykillers and The Danger Girl Starship Experiment at 8 p.m. And on May 8, check out the BMX Bike Expo at 1 p.m. Twenty-five percent of art sale proceeds go to the SLO Bike Coalition. 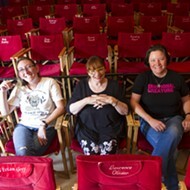 Get the full schedule of events on the gallery’s Facebook page under the “events” tab. I’m not exactly sure where 5805 El Camino Real is located, so we exit early and slowly roll through the longest town in the county. Atascadero’s “downtown” is essential a many-miles-long strip mall, a long corridor lined with low-slung buildings. Finally we spot it, “BIKE LANE GALLERY” hand-painted in bright colors in the expansive front window, plenty of bikes parked out front. The first thing I encounter is a “Beach Bike,” and unrideable objet d’art that features driftwood-surrounded bike frame, right down to driftwood “tires.” Cool! There’re paintings all over the walls and hanging from doors set up like French screens. Sculptures are tucked into corners and on shelves. 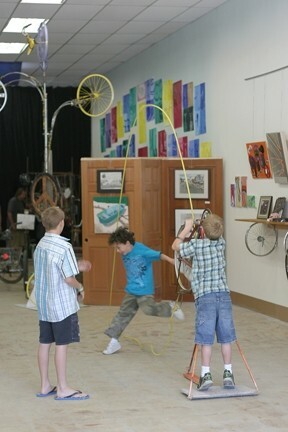 KIDS AT PLAY : There are several interactive contraptions for kids to play with, making this a very hands-on art gallery. What the hell is this? Some kind of contraption you stand on, then “pedal” a crank with your hands that turns a bike wheel that instead of a tire has a long piece of yellow rope in it. As I spin the crank, the rope begins to thread through the tire, suddenly kicking up in a giant loop toward the ceiling. The three kids in the gallery rush over for a turn, and as one sends the rope skyward, the other two leap through the moving hoop. Another station sends an electric charge up electrodes when you pedal it; another bounces a big collection of student-made wind chimes made from cut-up bike frames. 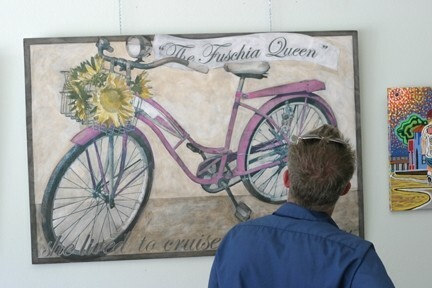 THE FUSCHIA QUEEN : Keith Bond checks out one of dozens of paintings on display through the gallery. The chimes, much of the art, and the banners placed throughout town were done by students at the Atascadero Fine Arts Academy, where exhibit organizer Tom Smith teaches fourth-grade core curriculum and fifth- through eighth-grade art classes. “The kids seem to be digging all this interactive stuff, eh Tom?” I say. 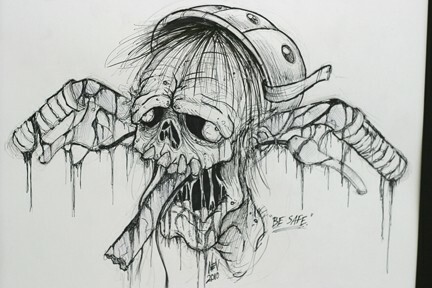 BETTER SAFE THAN SORRY : This graphic drawing brings tattoo culture to bicycling nightmares. “Kids love it, and we’ve got more stuff planned,” he said, dragging me down the street to show me some of the banners his kids made. After being nearly run off the sidewalk by one of his former students, we head back to the gallery where Tom says they’ll soon have art stations set up for people to make their own art. DON’T TOUCH! 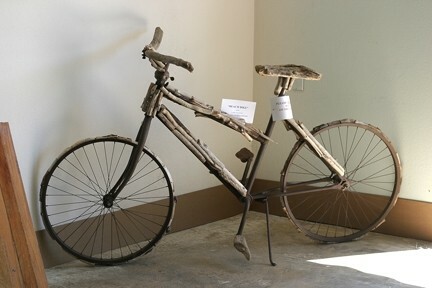 : This bike with driftwood additions is one of the few things in the gallery too delicate to touch. He’s as excited as the kids seem to be as they run around from one thing to another, exploring all this impromptu gallery has to offer. After digging the scene, Keith and I decide to bounce, so we head to In-N-Out (Thank you, Atascadero! ), chow down our double-doubles, and hit the road. When the belt snaps in my Corvair just south of Atascadero, we pull over and get greasy. That chocolate shake I got is so thick, it ought to be just about drinkable by the time we get a new belt on.